Need a fun, casual dessert idea for Easter? 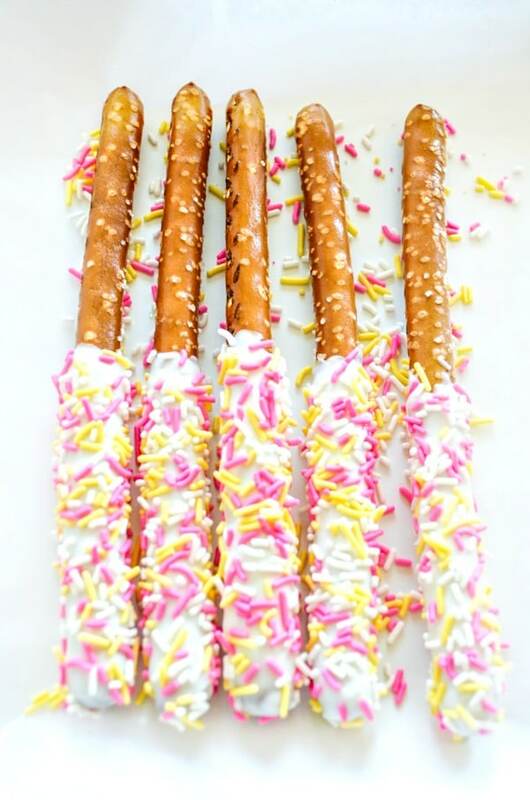 Try these white chocolate4 dipped pretzel rods rolled in sprinkles. They’re fast, easy, and a crowd pleaser. With the hustle and bustle and all that’s going on in my life right now, I’m trying to choose fast and easy projects this Easter. This way I can still help make the holiday fun for my family without sacrificing quality time with them. That’s why for my daughter’s preschool I elected to make an oldie but a favorite from years past – white chocolate covered pretzel rods! But I didn’t just dip the pretzel rods and call it a day. 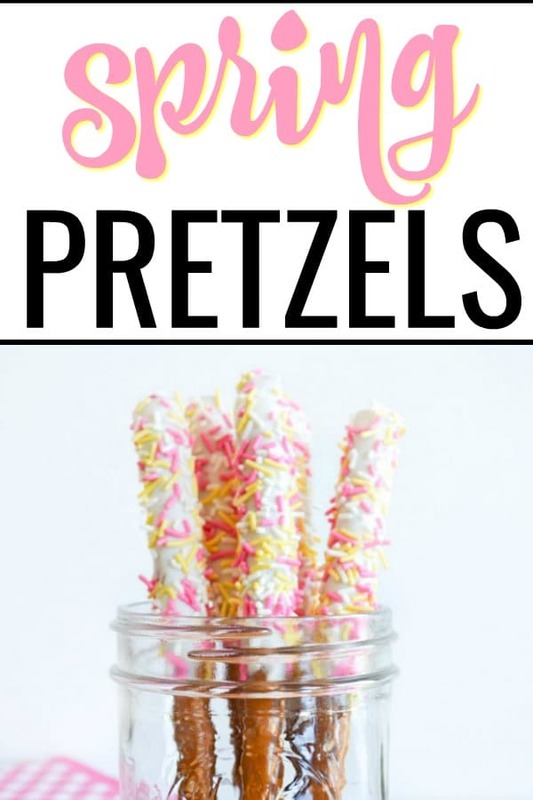 Instead, I rolled the pretzel rods in some pastel sprinkles for a colorful burst and a fun way to take this from an everyday treat to a themed Easter dessert. These white chocolate covered pretzel rods can also be made with milk chocolate. Although I think the white chocolate gives it more of a spring look. These chocolate covered pretzels are the perfect treat when you want something a little salty and a little sweet. But beware, these are addictive so I challenge you to just have one! Making these white chocolate covered pretzels is super easy! First, line a baking sheet with wax paper. If you’re using chocolate melting wafers, you’ll heat it in a microwave safe bowl according to the package directions. This will usually involve melting the chocolate at 15-30 second increments and stirring in between. You could also use a double boiler to melt the chocolate. But that’s way too much work for me! Then, you can start dipping half of the pretzel rod into the melted chocolate turning to equal coat the pretzel. Once you have a good layer of chocolate on the pretzel, begin turning the pretzel above the bowl to keep the chocolate even but remove any excess chocolate that might drip. 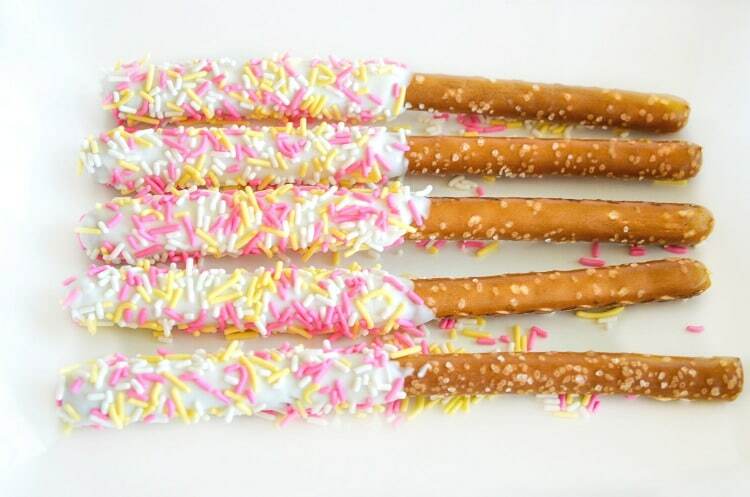 Make sure to add your sprinkles to the pretzel rods before the chocolate has dried all the way. Your chocolate coated pretzels will stay fresh in an airtight container at room temperature for 5-7 days. You can also share this Easter snack for kids by placing the pretzels in cellophane bags and closing with ribbon! You might also like these Red White and Blue Dipped Pretzel Rods to celebrate Memorial Day or 4th of July! 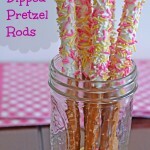 These chocolate dipped pretzel rods are just so easy to make and the perfect easy Easter dessert! Print out the recipe so you have it for later! Heat candy melts according to directions. Dip as much of the pretzel rod as you can into candy melt container. There are two ways you can apply the sprinkles or jimmies. You can gently shake the sprinkles over the pretzel rods to evenly coat the surface or you can pour some of the sprinkles onto a plate and then roll the pretzel rods on the plate. You can enjoy this special treat immediately or allow candy melts to set completely on a piece of wax paper, foil, or parchment paper. It's best to store these in an airtight container or storage bag to avoid staleness. 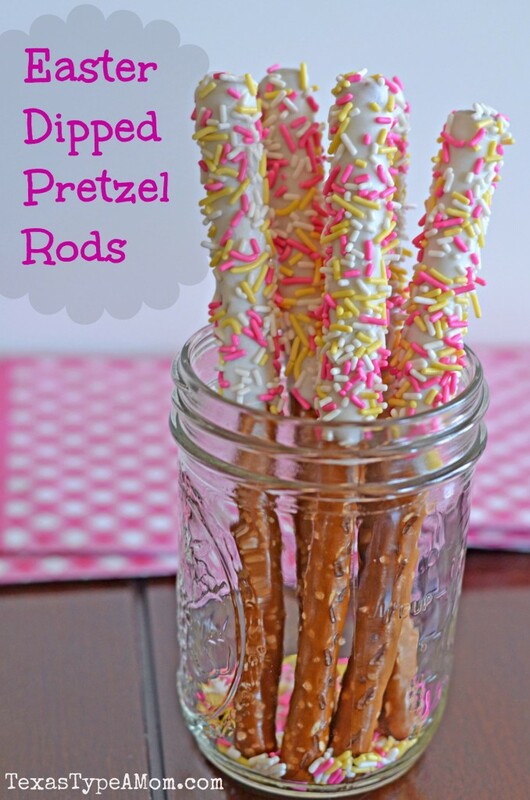 Make sure to pin these spring pretzel rods for later! What are you making for your Easter dessert? I love, love chocolate pretzels! I love to make chocolate covered pretzels – salty and sweet. Mmmmm! Yours are so cute, have a Happy Easter! These are such a cute idea for Easter–I’m sure the kids loved them! Those came out so cute and they’re so festive. I did something similar at Christmas and rolled my melted chocolate in crushed candy canes. I love the colors! I love chocolate pretzels. My oldest loves them! Those look soooooo delicious! I’m an enormous pretzel fan to begin with, but now you’ve done gone and tastied them up even more. Great photo!! So cute and I love the salty sweet combo…happy Easter to you and your family! I love making pretzel rods – but I usually make them for Christmas. Great idea to make them for Easter too! Great idea! So glad they actually make gluten free pretzels that taste good so I can do this for my kids :). Those look awesome! Great idea and cute too! Cute, kid friendly, and TASTY! Those are awesome! You can make those for pretty much every holiday, too! Everyone seems to love them, too. Those are so cute and springy! My mother used to make chocolate dipped pretzel rods all the time for Christmas. I love the idea of adding colorful sprinkles to make them for Easter. I bet those of really tasty. I love pretzels. what a fun & easy treat! They turned out cute. My kids love making these, too! These are so adorable! I love dipped pretzels! We love making dipped pretzels! These are a great idea – they look so good! Maybe I will try it for my son’s birthday party – they are easy for the younger kids to eat, and with the chocolate only being on one end, their hands may stay a little cleaner (wishful thinking?). This is a great idea! so simple too!!! We love making these! It’s a great recipe that the kids can help with. I LOVE LOVE LOVE LOVE LOVE these!!! (and always forget to make them!!) Yum yum! This is such a fun and tasty project. I love how you added the sprinkles. Those are adorable and so easy. This is beautiful and looks delicious! I featured this recipe on my blog http://www.babymoonbtq.com/2014/04/5-easter-dessert-recipes.html Happy Easter!